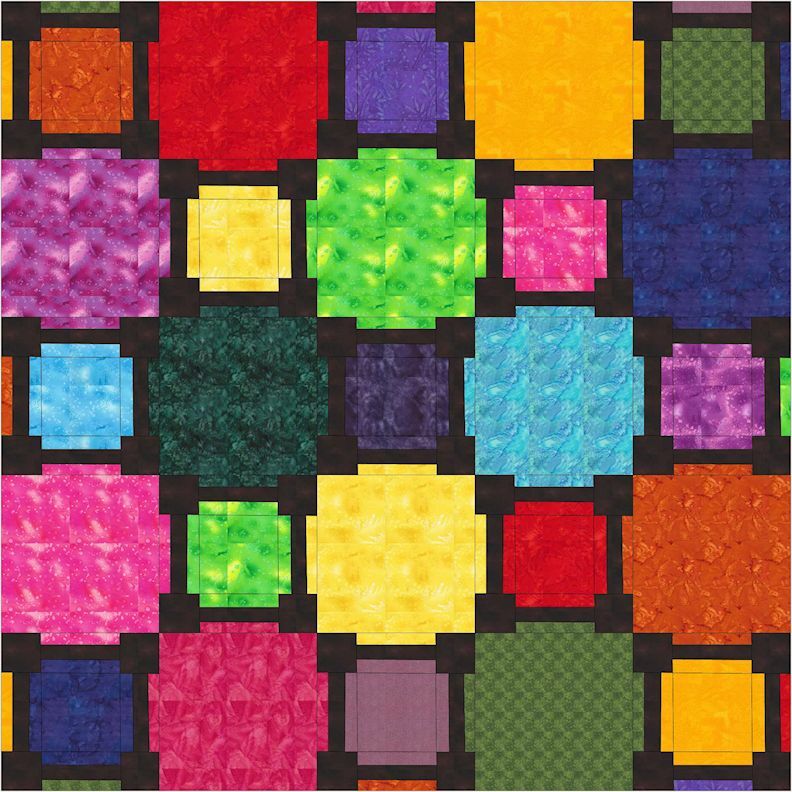 I have been working on SCRAPITUDE blocks for a quilt. This is from Sandy of QUILTING FOR THE REST OF US MYSTERY QUILT ( see links below) … THIS makes a really cute quilt and I have plans to make more of these blocks. I have TONS of scraps. I should say I lifted the block above from somewhere on the internet. (SANDY’s blog) A picture of my block is below. I did have a problem with the Triangle block in this quilt and it was from my technique. The directions say you will need to square up this unit. I squared up a number of them incorrectly which resulted in cut off points. Once I figured out what I was doing wrong I made an illustration of how to square up the block correctly. I am posting this as a reminder to myself and hopefully help other avoid this problem in their blocks. 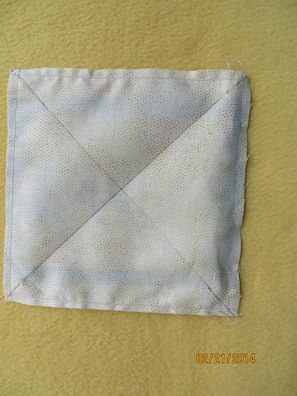 It is important to maintain the quarter inch seam at the top of the block. All trimming should be from the large triangle portion of the patch. I marked the areas on the illustrations with yellow areas. 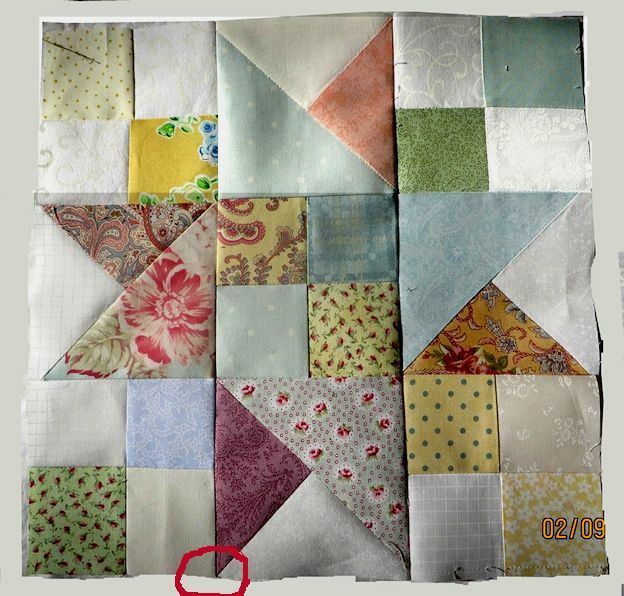 Here is my block I circled the patch I cut off the tips of my outer triangles… This block was a vast improvement from the first block I made. I do think it is rather pretty. Here is my plan for my future SCRAPITUDE QUILT … Alternating blocks with lots of white space … I would only have to make 12 to 15 blocks to make the quilt I want to make. Here is an illustration of the EQ7 design. 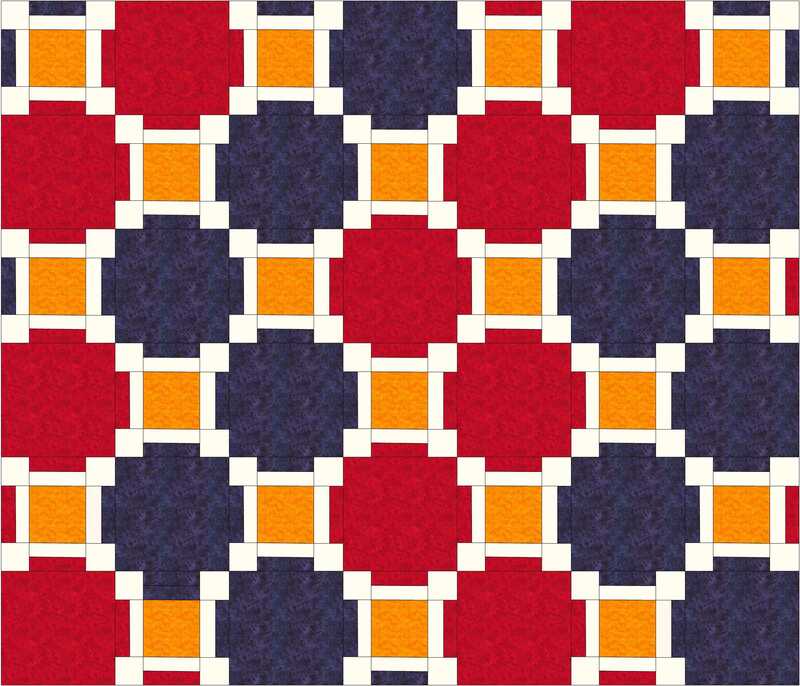 I have found some cute baby fabric I can use to make this quilt as a 3 block by 3 block layout. Using large blocks result in faster assembly. And as you know .. we have babies coming to this family. Well this is all for now… got to get to WALMARTS to buy some plastic tubs. This will be my first trip out of the house.. Being sick this last week I was unable to do anything constructive (ie sewing … drippy noses, sick to my stomach did not allow sewing) I spent a lot of time surfing the internet and playing on EQ7. 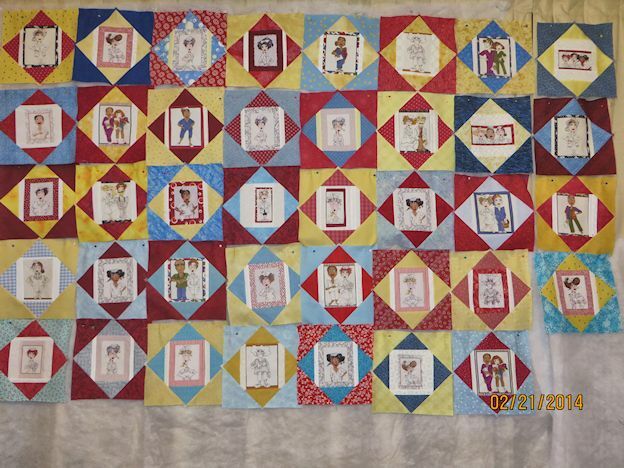 I found some really neat pictures of quilts and then played with drafting the blocks in EQ7. This was my favorite pastime between taking naps. 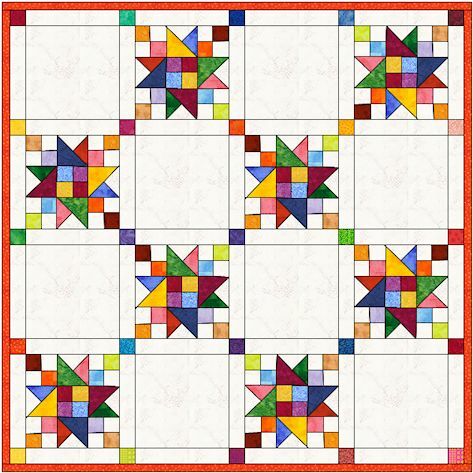 I am posting one of the quilts I drafted with some basic instructions for making the quilt. 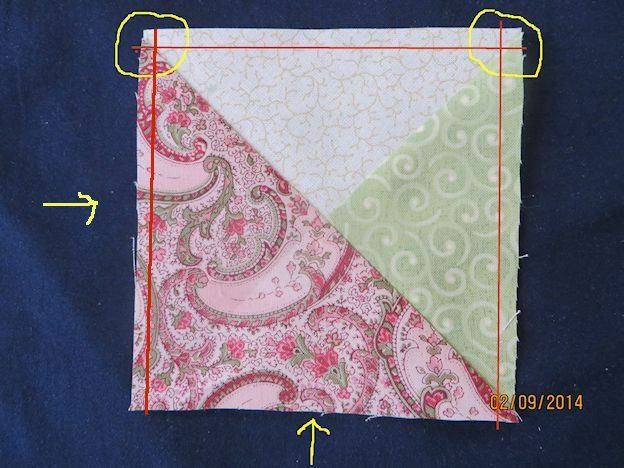 I am a novice at writing patterns so I do not recommend a new / novice quilter trying this pattern out. I think you need to have some understanding of cutting and quilting to make this pattern. I also think a DESIGN WALL is absolutely VITAL to assembling this quilt. It is a giant color puzzle. I am including different colorways for inspiration. 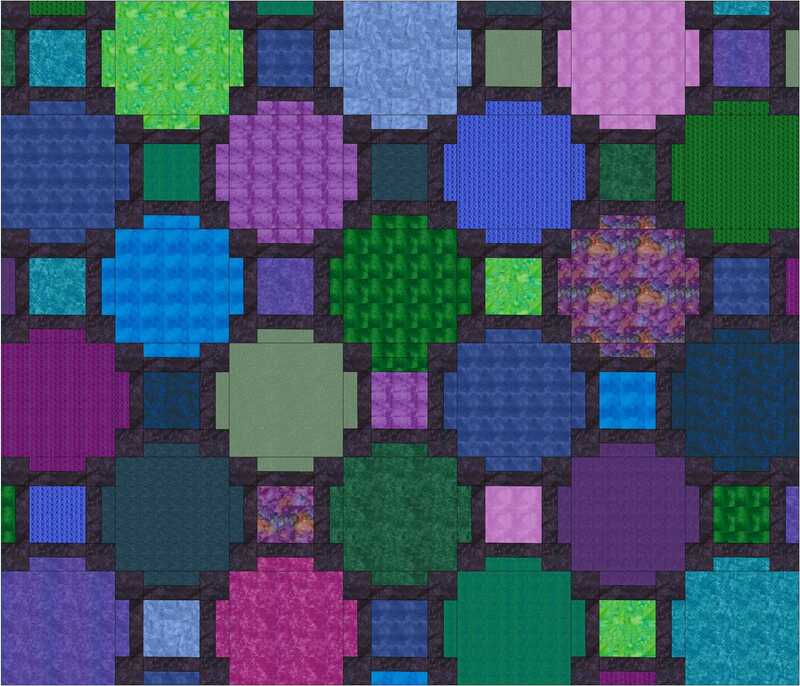 And an illustration for block B. I hope this might inspire people to learn EQ7 and design some of their own quilt patterns. I enjoy buying quilt patterns but sometimes I can not find them on line or from their origins, so I have to design my own. Fabric: 1/2 YARD for each large patch. You should cut other patches at the same time. 8.5 inch x 2.5 x 4 patches for each block. I plan to cut a strip when I cut the larger 16. 5 patch. These strips match a neighboring 16.5 PATCH A. Cut 8.5 in square for the center patch of any color you choose. I will scatter these blocks to the opposite side of the quilt. This is a mock up of BLOCK B. it is what is called AN UNEVEN NINE PATCH. 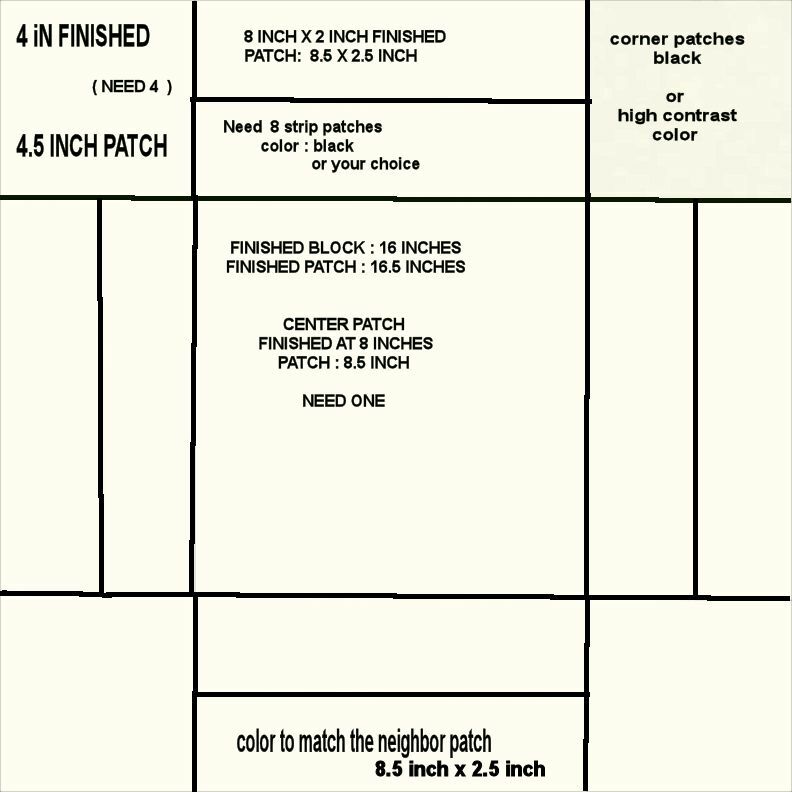 You will also need also need the 8.5 x 2.5 inch strips to match the neighboring Block A to construct this patch. BLACK CORNER SQUARES: 4.5 inch you need 4 for each block. Black Strips: 8.5 inch x 2.5 inch .x 4 patches for each block. This patch is is next to the small 8.5 colored patches to frame that block. I consider the outer blocks unfinished along the border and plan to design the border so that the large patches have their strips carried off into the border. Not sure if I will do anything with the BLOCK B patches in the border… I will probably keep it solid black. This is my retirement quilt. I am making 64 blocks (8×8 layout) of my 12 inch blocks ( Queen Size.) It will be re organizing them before I actually sew them together. I do not care for the right to left diagonal setting that occurred with the colors. I thought it would be left upper to right lower diagonal and I do not know what I did wrong. I am going to lay the quilt out again. I also think I need to balance the quilt colors better I need to put in more blocks with the dark blue outer fabric through out the quilt. I am also trying to make sure no two same nurse characters are next to each other. I really wonder how I get myself into these predicaments. 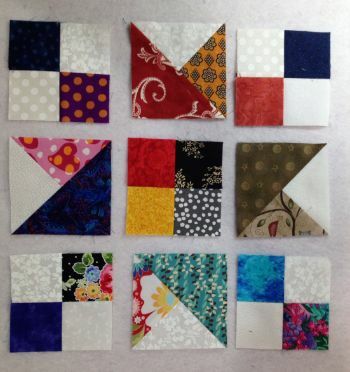 I am publishing the steps I have been using to make my blocks using LORALI DESIGNS NURSEs as my focus fabric ( center) I am hoping you might have some focus fabric and will take inspiration from this to make your own quilt. Once again I am designing my quilt based on the fact that I think fabric talks to me and tells me what kind of quilt it wants to be. The pictures are thumb size, click on them to see the larger picture. 1./ My novelty fabric is a rectangle. 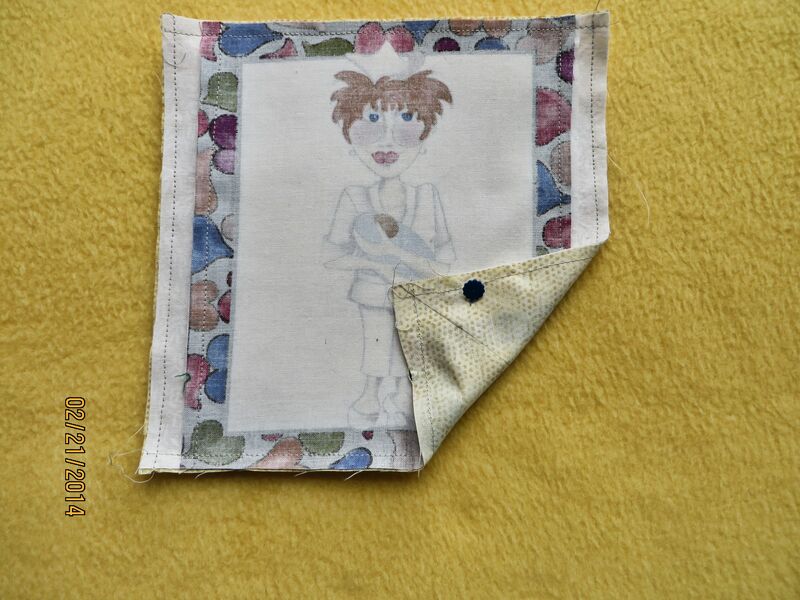 I added fabrics to make the patches into a square. 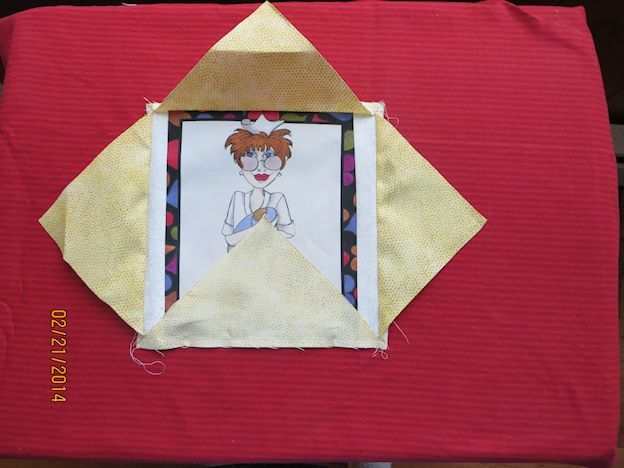 Each block was shaped slightly different so I added a fabric to turn the patches into a square. I then squared up all the patches to the same size. Here I am using 7.5 inches square. I starched each patch heavily before sewing. YOU will be dealing with a lot of bias edges during this technique. 2/ I then sewed an equal 7.5 inch square to the focus fabric. I will tell you that I did cut some of the patches a scant 1/8th inch larger than the focus fabric. This gave a little leeway when sewing the patches together. It made the blocks easier to cut on the diagonal. It made no difference in the block afterwards as it gets squared up to the same size before going to the second round. 3/ Once the patches are sewn together I mark the back on a diagonal, then I clipped on the mark lines to open up the patches. Be careful so as not to clip the front focus fabric. All edges cut will be on the bias so be careful not to stretch the seams. 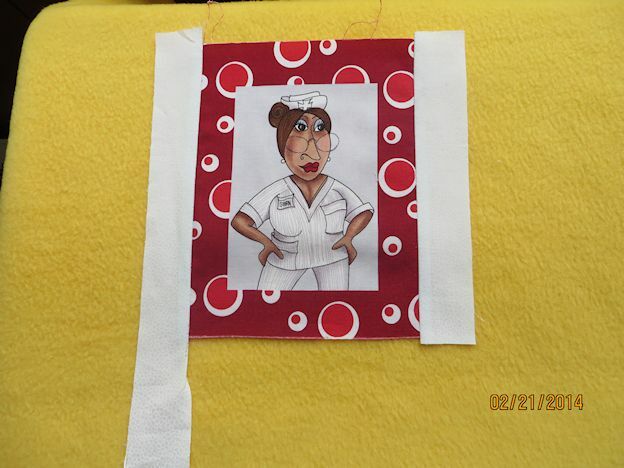 I starched at each step to keep the patches stiff making them easier to work with and sew. 4/ Once the diagonals are opened up you need to press carefully. The NEW FOCUS PATCH is now ON POINT……. REMEMBER every cut edge is on the bias and needs to be treated gently. Once this patch is opened I squared up the new focus patch to 9.5 inches. I once again I repeated the technique sewing a second 9.5 inch patch to the new focus patch. I then marked and cut open the diagonal the new block was 12.5 inches and was now in a straight setting. All ODD ROUNDS will be on point and all EVEN ROUND will be on a straight setting. You can continue this technique for as many rounds as you want. YOU can also use smaller centers to start your blocks. YOU will have to figure out your own sizes to keep the blocks consistent. Refer back to the original post for links and references to books that discuss the technique. .
MORE to come in future posts …. “http://theaudacitytopodcast.com/…. AUDACITY to PODCAST …..
How to direct DOWNLOAD a podcast . . . .